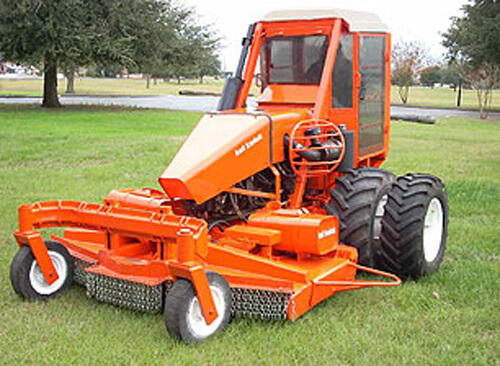 The MegaSlopeMaster is the big brother of the SuperSlopeMaster slope mower. It is used in the same environment as the SuperSlopeMaster offering the extra duty commercial user with a larger machine. The 88" wide cutter deck and big 72 HP diesel engine will mow through the toughest growth on up to 40° slopes. This truly is a brush clearing giant. 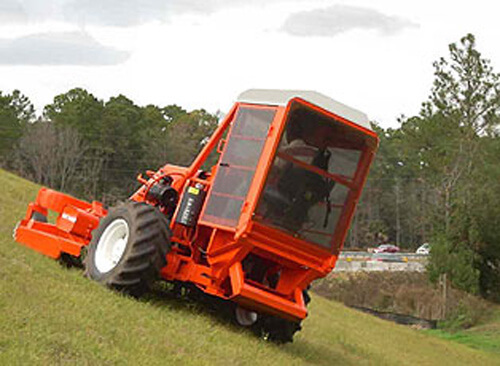 It is the largest zero-turn-radius (ZTR) steep slope mower manufactured in the world. 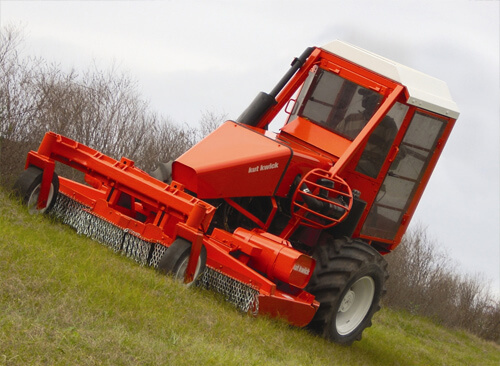 With an 88” swath, nothing will cut your slopes faster or more efficiently than this slope mowing machine. 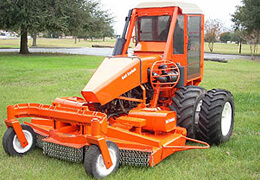 The MegaSlopeMaster a commercial mower designed for land clearing to cut rough terrain, including heavy grass and weeds, as well as light brush and small saplings. It is powered by a water cooled 72 HP Yanmar Turbo Diesel, turning three 3/8” thick cutting blades. Each of the three blades has its own hydraulic drive motor eliminating the typical single drive belt. The machine is built using 1/4" steel members. It will withstand impacting an object at 6MPH without damage to the machine. The mowed materials are rear discharged for maximum safety from thrown objects. 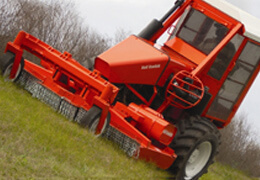 These blades are manufactured in both flat and high lift configurations to handle both rough cutting and finish mowing. Combine that cutting power with true zero-turn-radius maneuverability, and you have the most efficient slope mowing machine in the world. Other skid steer zero-turn-radius machines cannot compete with the MegaSlopeMaster. Oil Reservoir: 58 gallon hydraulic oil reservoir with oil/air separator, to prevent foaming, overheating and water intrusion from condensation. Years of experience with the SuperSlopeMaster confirmed that for maximum efficiency, the machine needed to be a true zero-turn-radius style machine. Close trimming is now possible with out a second machine! The heavy duty deck can handle all grass and brush mowing without leaving the slope. The machine's power allows it to cut the tallest grasses without slowing and its special antiwrapping devices automatically remove spindle wraps. Safety was an equally important design criteria. As with all Kut Kwick machines, the operator is seated at the rear of the machine close to the ground as far away as possible from the moving parts of the engine and deck. Should the operator need to get off the machine in case of an emergency, the first step is onto solid ground and that step will be at the far extremity of the machine away from the cutter deck. The machine is fitted with a safety lanyard that not only stops the engine and deck, but locks the machine down automatically stopping the machine if the operator leaves the seat. The design with an out front deck is also a great safety feature. 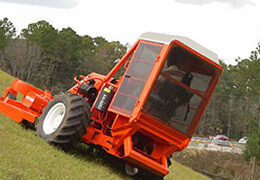 It assures that the operator will avoid one of the most frequent tractor drawn rotary mower accidents that occurs because the tractor operator has to continuously look back over his shoulder to observe the cutter operation. The operator of the MegaSlopeMaster knows what the problems ahead may be because the operator is always looking forward. All the controls of the MegaSlopeMaster are ergonomically located for safety and convenience. The tilting seat keeps the operator up-right even when cutting on slopes. The tilting seat mechanism allows the operator to safely and smoothly turn the machine 180°, reversing the direction of travel on the slope without stopping. The joy-stick style controls are attached to the arms of the seat and move with the seat. The joysticks are operated independently to steer the machine and to control its speed. The machine can be made to reverse its direction by directing one joystick forward causing the wheel on that side to roll forward while the opposite joystick is directed back causing its wheel to roll in reverse making the machine change direction within a zero-turn-radius (ZTR). Additional security is provided by the 4-point harness that is built into the seat. Click here to see how Better Roads™ rates Kut Kwick commercial mowers! The MegaSlopeMaster® design is patented.